News sites become extremely popular. They need to be able to showcase a larger amount of content on a single screen. There are several other large number of news websites using WordPress. WordPress is a most popular platform among the developer around the word. It is to some extent a disruptive technology not only dominating the blogging space. A great looking and feature rich WordPress news theme can be excellent for building a news website or magazine. Below we have compiled a list of best NEWS WordPress themes. There are many news style templates out there. All themes are premium, so they come with support and is loaded with great features and options. 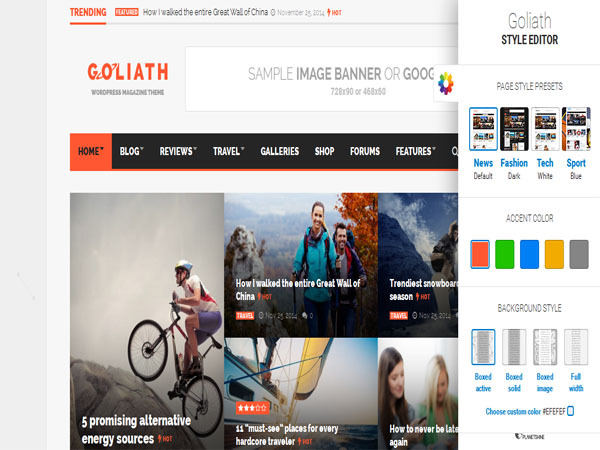 GOLIATH is a Modern design WordPress theme for Magazine and News websites. It is fully responsive and runs efficiently on any devices like computer, smartphones and tablet. Theme comes with a drag and drop mega menu. The theme comes with bbPress plugin integration and WPML ready. This theme has modern photo galleries. Theme allow you to create the best looking sliders out there with Revolution slider. It is multi language supported theme design. 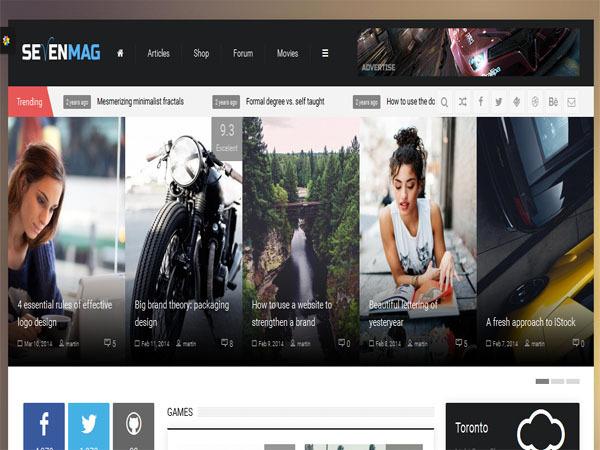 MAG is a well designed WordPress theme. This is a highly customisable and fully responsive theme design. Theme comes with 10 custom widgets and it has unlimited sidebars for pages. Theme has beautiful 600+ google fonts. It has impressive Drag and Drop gallery images and custom logo options. 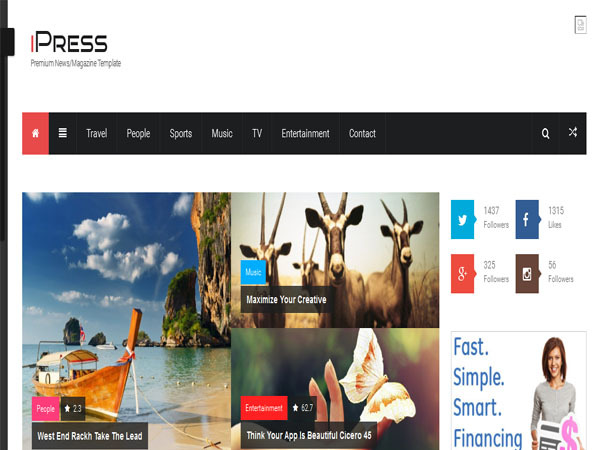 iPress is a technologically impressive WordPress theme design. It comes with modern and elegant powerful page builder and advanced theme options. 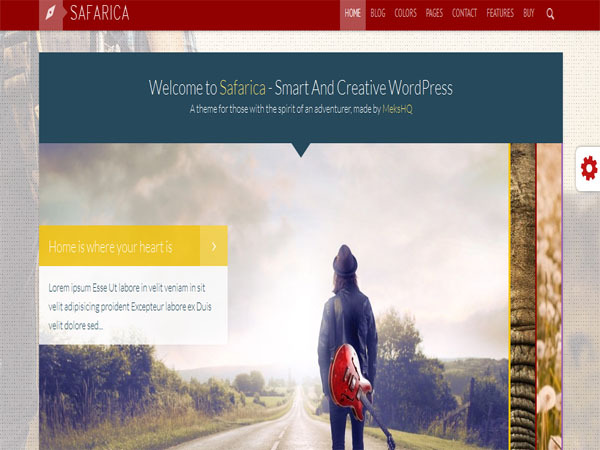 Theme is fully customizable and fully responsive design. It is supper flexible WordPress theme design. Theme has responsive layout that addapts to smaller devices. It has unlimited theme Color scheme. StyleBlog is clean and Modern WordPress theme comes with fully responsive layout. It’s all functions are based on solid back-end framework. This theme comes with advanced theme admin panel. It has unlimited color schemes and infinite scrolling. Theme has beautiful main menu with dropdowns and WooCommerce support. 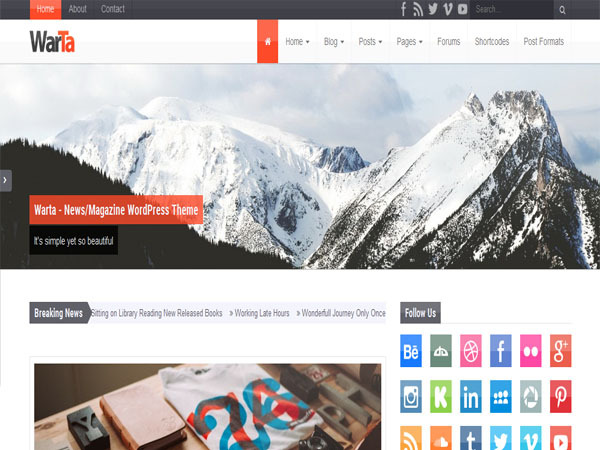 SevenMag is a clean and professional looking WordPress theme. It has powerful page builder and advanced theme options. It is fully responsive theme design. This is SEO optimized theme design. Theme has unlimited theme color scheme and 13 custom Widgets comes with widgets content included. Theme comes with awesome social media integration post. Flagman flexible and fully responsive WordPress theme design. Flagman developed on the Bootstrap. Flagman can be configured to focus on your work, your blogging, or both. It has awesome unlimited home page layouts and custom backgrounds. It has custom Backgrounds feature allows you to set a custom background per page as well as set up a default background for all other pages/posts. Theme allows you to easily adjust the theme colors via a color picker in the theme options panel. 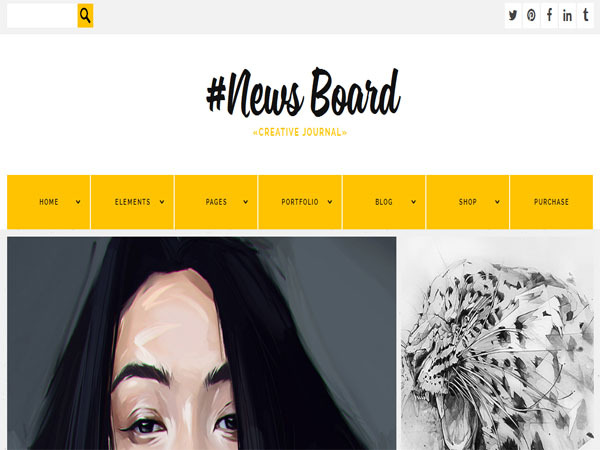 News Board is a clean and modern WordPress theme. This is responsive designs that addapts to smaller devices. It is retina ready design. Theme comes with multiple slideshows. You can add multiple to each post, page or portfolio entry. It has unlimited color Options with backend color picker for any kind of gorgeous color settings. Theme is SEO optimized. The code is built with SEO best practice in mind, headings, google rich snippets and much much more. 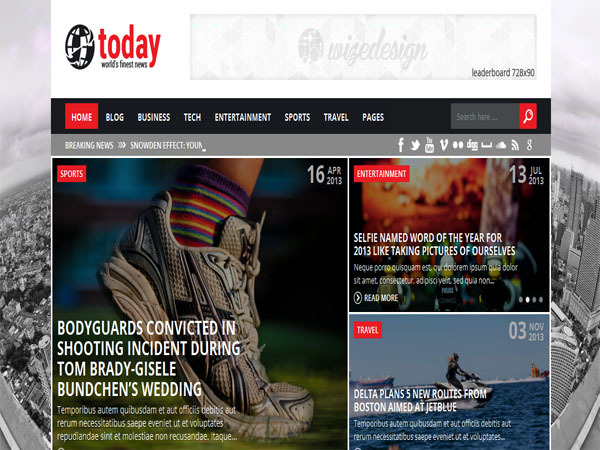 Today is a sleek and modern News and magazine WordPress theme. Today theme comes with an extended range of choice regarding the style variation of blog arrangement. This theme comes with the possibility of customization in every color possible. Today theme has a tremendous number of fonts that can be used 600+ google fonts. This theme can host videos from youtube and also from vimeo. 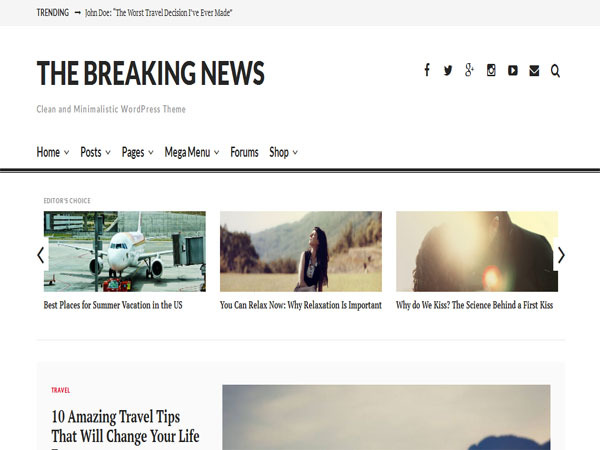 The Breaking News is a modern and elegant responsive WordPress theme. The Breaking News theme is ready for mobile devices. So your site content will always look beautiful on smartphones, tablets, laptops and desktop screens. This theme is perfect for news and magazine sites as well as blogs. Theme comes with custom logo and favicon upload and unlimited colors. 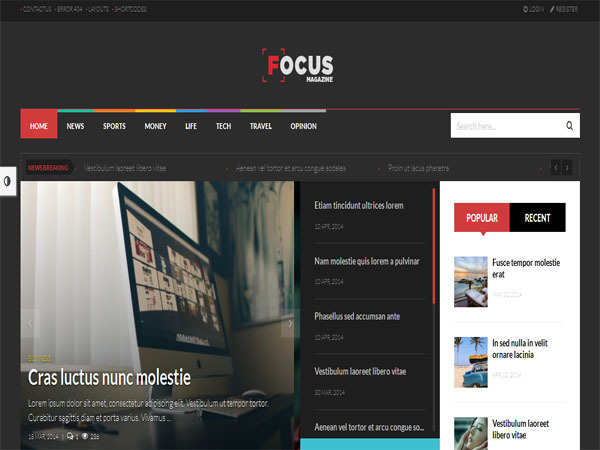 Focus is a best news and multipurpose WP theme. This theme is built in WPO framework and Bootstrap 3.0. Theme has unlimited predefined color schemes and HTML5 and CSS3 support. This theme included with lot of widgets. Great News Magazine is a responsive WordPress theme. Theme has unlimited colors options with color picker in backend. Theme comes with unlimited sidebar and visual shortcode generator. It comes with beautiful multi level drop down menu. 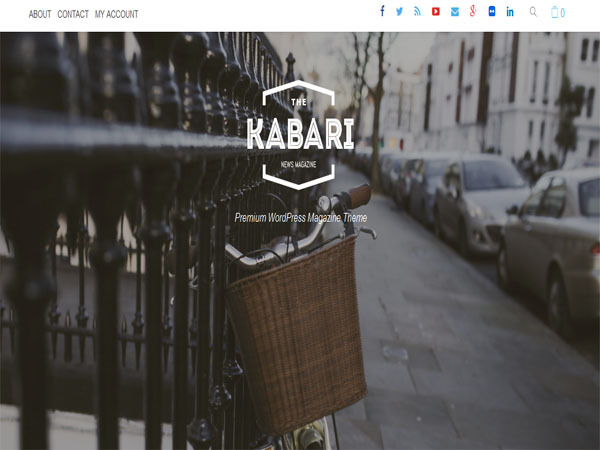 Kabari is an indispensable News and Magazine WordPress theme. Kabari already SEO optimized and has a valid HTML5 that works well with popular SEO plugins. Theme has 10 possible layout design. This theme come up with 3 custom page layouts. Theme comes with home builder. you can have unlimited homepage layout using visual composer plugin. 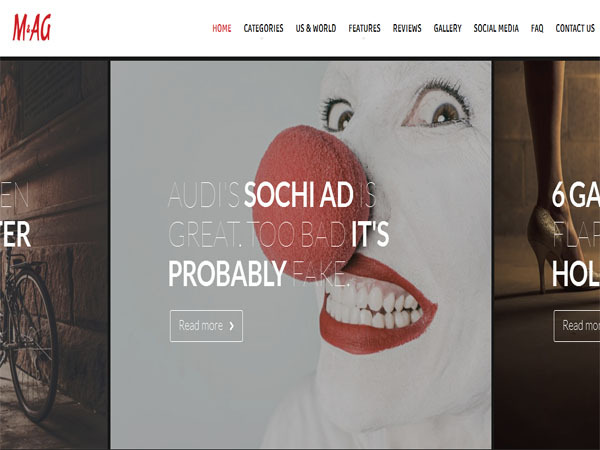 Warta is a unique responsive WordPress News and Magazine theme. Theme comes with fully responsive layout and translation ready. Theme has bbPress ready and WPML ready. This theme has impressive page builder. Warta theme has beautiful Google fonts and font awesome icons. 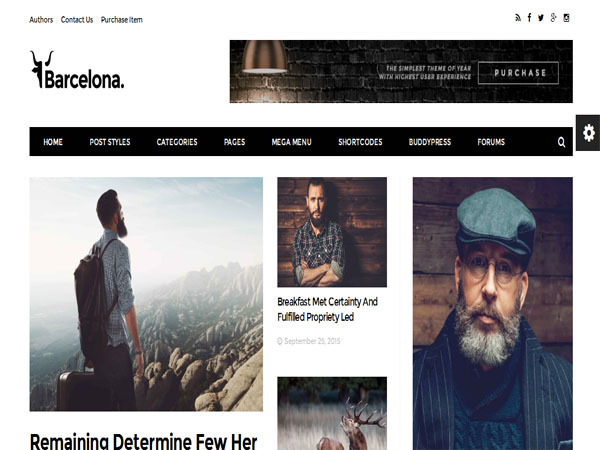 Barcelona is an excellent News and Magazine WordPress theme. This is fully responsive theme design based on Bootstrap 3.4.3. Theme has custom background category, post, page, search results page and archive pages. It comes with 6 different post featured image styles and ready for 7 usable widget. This theme compatible with cross browser. 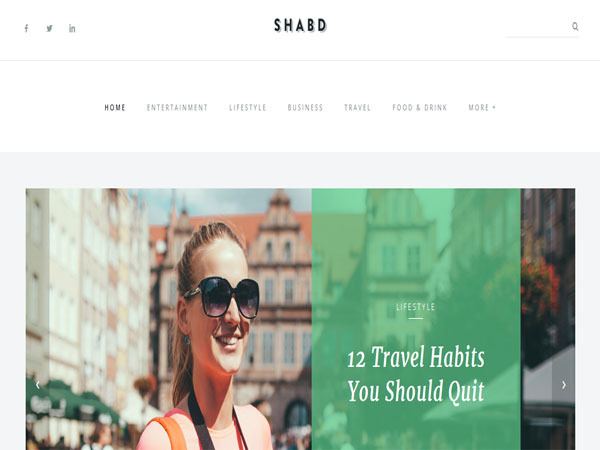 SHABD is a clean and dynamic WordPress theme. This theme comes with many powerful features. Theme is easy to build and easy to use. It is totally SEO friendly theme design. This theme has custom widgets and multiple sidebars. It has multiple sidebars and WPML ready and yoast Seo WordPress plugin compatible also. Voice is a professionally designed WordPress theme. It is highly customizable theme. Voice theme is made with a modern responsive design. With Voice theme your website will look just as good on big screens as it will on tablets and mobile phones. This theme comes with an advanced and easy to use theme options panel. You will setup your website in 5 minutes. Theme has unlimited sidebars + sticky sidebars. You can add as many sidebars as you want. 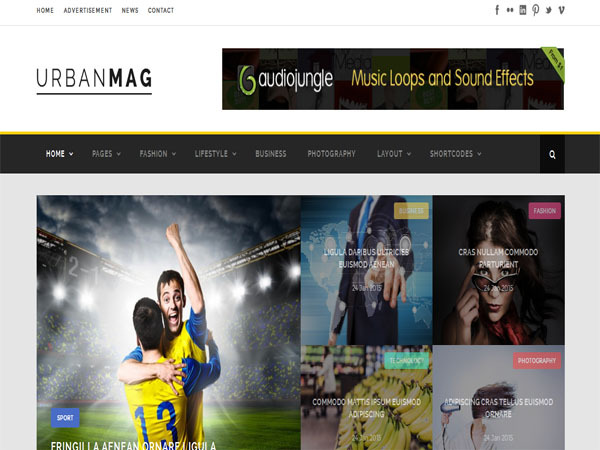 Urban Mag is a clean, modern and fully responsive WordPress theme designed as news magazine theme. This theme comes with 4 predefined styles. You can use GoodLayers importer plugin to import your prefered demo with only one click. This theme comes with 4 predefined styles. Theme has layout builder for homepage. You are allowed to create custom skin via admin panel and assign to parallax section easily. This theme has unlimited color. You can turn your site to anything you need with color options. You can change almost every color elements. Newgen is an advanced and responsive WordPress theme. Theme has custom sidebars compatible and Woocommerce shop compatible. Theme comes with 9 beautiful and impressive page templates. It comes with 80+ theme options. Theme come up with 8 custom widgets. 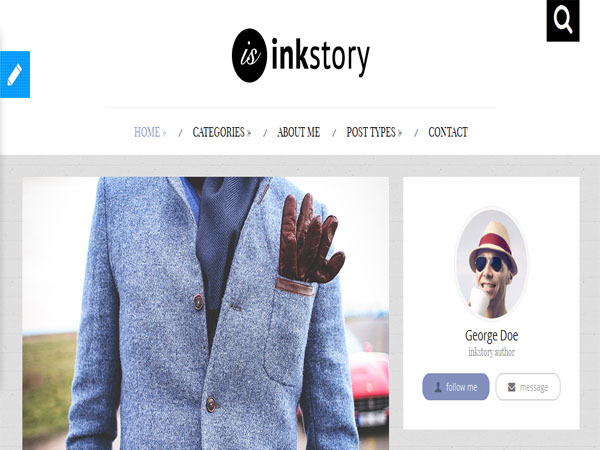 InkStory is a well designed WordPress theme. This is fully responsive design and fits for each device. Theme comes with 2 different header styles and unlimited sidebars. You can set any sidebar to any page/category. This theme is easy to use visual composer. Caps is a modern and elegant WordPress theme. 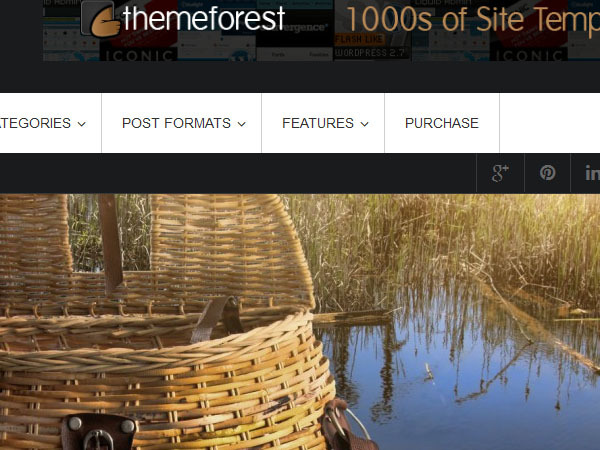 This theme has Google fonts supported and Woocommerce supported. It comes with most powerful and advanced theme options. This theme is built on bootstrap responsive format that automatically adapts to fit any screen devices. It is fully compatible with Firefox, Chrome, Safari, Opera etc.